RESIDENTS LIVING NEAR a landfill in Co Meath have expressed concern about a proposal to significantly increase the amount of waste it takes in and to expand its operations. 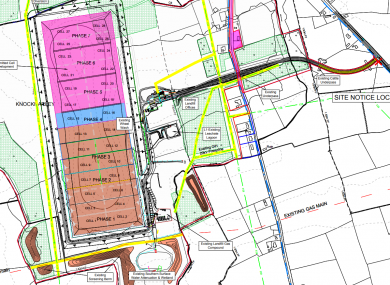 The firm behind the development, Fehily Timoney & Company, applied on 12 December for planning permission for a number of changes to the Knockharley Landfill site. The proposal has been met by strong opposition from residents who are worried about the impact of the increased activity at the landfill on their lives and environment. The intake of up to 5,000 tonnes of stable non-reactive hazardous waste each year. Local resident Paul Walsh told TheJournal.ie said he believes the scale of the proposals “doesn’t make sense”. Walsh is worried about the inclusion of “hazardous waste” as he said residents have not been told what exactly this will mean. He said people living in the vicinity of the landfill have made complaints to the Environmental Protection Agency over the years – usually about odour – but they do not feel enough action has been taken to address their grievances. Fianna Fáil councillor Claire O’Driscoll said increasing the tonnage at the landfill will ultimately “increase the level of nuisance”. With this plan they want to put in a biological treatment plant and that will be operational 24/7 whereas the general processing of waste is just the core hours. O’Driscoll said a landfill is supposed to have an end-date and this proposal would significantly expand the lifespan of the site if developments like the biological treatment plant and the storage of baled recyclable waste are added. The locals have been expecting that eventually the work there would come to an end. And there are people who bought homes in recent years with the expectation that it would close after 15 years. She also said a man at a recent community meeting said he had decided not to send his son to the local school because of its proximity to the plant. O’Driscoll said members of the public have until close of business today to make a submission on the proposals to An Bord Pleanala. A spokesperson for Fehily Timoney & Company, said the waste types which would be accepted as part of the proposed extended development are “the same as those currently accepted with the additional of two new waste types”. These are; stable non-reactive hazardous waste (maximum 5,000 tonnes per annum) and the contingency storage of baled recyclable waste. “Planning permission was first granted in 2002 and the facility has operated in Kentstown since 2004 under a licence from the Environmental Protection Agency,” they said. Meath County Council said as this a Strategic Infrastructure Development, the decision “is a matter for An Bord Pleanála”. Email “Concern over proposal for 'massive' increase in waste intake at Meath landfill”. Feedback on “Concern over proposal for 'massive' increase in waste intake at Meath landfill”.